As she shouted his name he spotted her, across the chasm, partway down from where he was. He raised his hand and whistled, waving in her direction. He saw the chief nearby on his side and walked to his side, "This is not what I expected." He had an urge to join Amber, but he also had a sworn duty. He knelt at the edge of the chasm and began to silently pray, preparing those who had fallen for the spirit world. 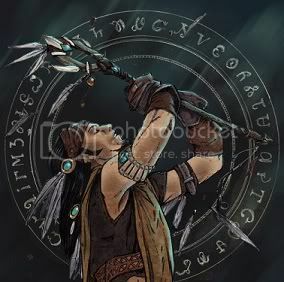 Hotah stood over the young shaman. It meant a great deal to him, such respect for the dead. He smiled a little and stood silently while Asher prayed. Others started to join them, looking towards the shaman for comfort. Amber lowered her arms when she saw Asher. She was sad, her new friend and her father stood on one side of the divide while she stood on the other. She heard a soft voice call her name, the voice of her mother. She followed the sound among the rubble. “Mother?” She spotted her at last, but put her hands to her mouth when Amber saw the state she was in. Her mother wouldn’t live long, her body crushed by fallen rocks. Her mother reached out her hand and Amber knelt beside her, taking her mother’s hand in hers. She gave her daughter a small, sad smile and lowered her forehead to the ground. She didn’t move after that. Amber pulled her knees to her chest and hugged them with her arms. She waited for her mother to say something else, to say that she would be fine. She had always been there… why not now? As he prayed he felt Amber's mother's spirit pass by and he frowned, no doubt she had found her. He dropped several flower petals down the chasm, ending the sending ritual. He turned back to face the chief, curious on what his plans were. The chasm was enormous but with time they could go around, and there was still the matter of the Eikem. The Eikem would be able to swiftly destroy the small contingents that were now split on both sides. Tears began to run down Amber’s face, making rivulets on the dust that had settled on her body. This was just too much. She was separated from her father, her friend and now her mother was gone. To make it worse the Eikem were still out there. There was wailing all around her by the women and children. Loved ones had been lost forever. They were not coming back. Amber wiped her face and looked down at her mother. She reached down and removed her mother’s bracelets, looking at them and sliding them over her wrists. She slowly got up and turned to the tribe. There was nothing to do but go forward now. If Ahote had survived he would be the choice to follow. But since he was gone they would be looking to the chief’s daughter for guidance. She hadn’t been prepared for that. They needed weapons, tools and food. The huts were destroyed and in a shambled but perhaps they could rummage through the rubble and see what they can find. Amber started to pick through the rubble, and after a moment the rest did the same. Hotah was just as resourceful. After Asher had completed the spirit ceremony, he had the remaining tribe search as well. After Asher had done some preliminary gathering for their group he approached Hotah, dropping to a knee again, "Glorious chieftain.. I request something of you." He looked up at him, "Your daughter.. Amber, she approached me with a desire to learn the mystic arts, and I accepted. She is now my apprentice, and my values tell me I can not abandon her. I have also sworn fealty to you though, so I humbly ask that I may rejoin your daughter on the other side and continue to protect and guide her." He lowered his head in respect, waiting for an answer. He smiled and stood, bowing again, "Be safe chieftain.. the people need you. Whisper to the winds if you need me." He turned and walked towards the chasm that now segmented their settlement, looking down the gauge the distance and depth. He reached to his necklace and gripped a small talon that hung from it, the talon of a raven. He gazed at it for a moment, then cut the palm of his hand with it, gripping it firmly as the blood dripped from his hand. He then started whispering a spell, then he leapt from the edge of chasm. Feathers started to sprout from his arms and body then there was a stream-like explosion of smoke, and in a seamless motion he shifted to the form of a raven, sailing across the gap. He soared over the other side of the village, looking for Amber. After a moment he spotted her and swooped down toward her, suspending for just a moment before the ground. Another stream of smoke surrounded him and his real form dropped to the ground, handfuls of black feathers slowly coming to a rest around him. He stood up, looking to be in slight pain, "Amber.. are you well?" There were gasps of surprise, sounds of awe, as the shaman transformed into the black bird. Some were even afraid of the magic, shrinking back in fear. On Amber’s side, a warrior pointed towards the sky as Asher crossed the chasm as the raven. She turned and raised her head, her jaw dropping a little at what they were witnessing. As Asher dropped down, returning to human form, many backed away to give him room. Amber held a spear and had scavenged a bow. There were many broken arrows but the arrowheads could be used again. Full transformations took quite a physical toll, he looked tired, "I know.. I felt her, she is with the spirits now, I am sorry. Your father is fine, he is coordinating the other side, I am not sure what he plans to do." He reached down, running his fingers over the dirt to feel the emotions of the earth. He looked up to her as he did, "I asked him if I could return to you.. I am gracious that he accepted." He started looking around, "Where is your.. mate?" He nodded, "Where is it you plan to go?" He nodded again, "Things do happen for a reason, certainly.. it sounds like a good plan. It is well that the people have someone to lead them in this time." He went to his hut, which just happened to be on this side and gathered all the reagents and materials that he could hold in his pack then returned to Amber. "If there is anything I can help you with, please let me know. I will stay with you." Amber smiled at him before she gathered the small clan and explainedwhat they were going to do and where she planned to lead them. There was hesitation since they would be trespassing on the island of the gods but bolstered by her confidence they picked up the salvaged belongings and started the dangerous trek through hostile lands. Amber hoped they woulld not cross the Eikems path. Asher followed at her side, helping with whatever may need to be done. When they set out he began to think, he wasn't sure if the spirits would allow them to trespass on their island, especially so many unbelievers throughout the tribe. Thankfully he'd be there and hopefully he could plead with them to give them shelter, but then again he wasn't even sure if the Eikem cared about defiling the lands of the gods. As he followed at Amber's side he turned to her, "I know you have been through some turmoil.. but now that we have a moment, have you any questions for me regarding your teachings?"